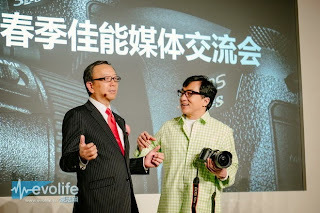 Hybrid Camera Revolution: 4K Canon EOS One - the Panasonic FZ1000 killer? 4K Canon EOS One - the Panasonic FZ1000 killer? Looks like Canon is finally about to enter the consumer 4K video market. 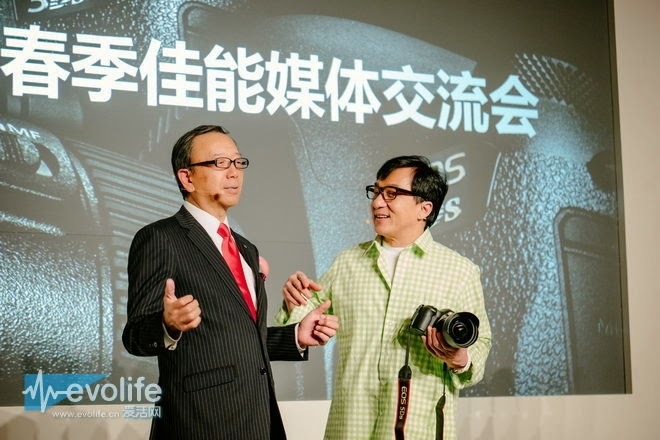 Chinese tech site Evolife is reporting that "surprise guest" Jackie Chan joined Canon China Chairman Hideki Ozawa onstage at the Canon Spring Conference in Shanghai yesterday to introduce a new 4K concept camera - the Canon EOS One. 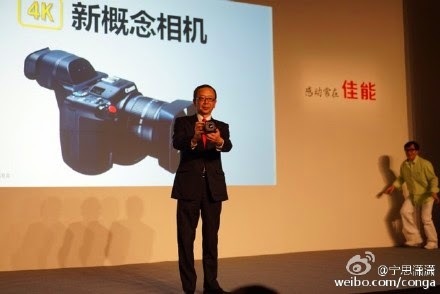 Canon hasn't released the specs yet, but you can see from the photos above that the camera has an external LCD viewfinder and a fixed 10x 8.9-89mm f2.8-5.6 zoom lens - which means it probably has a 1" sensor. This puts it squarely in competition with Panasonic's hot-selling 4K FZ1000, which has had the 4K superzoom market all to itself - until now. This is very good news for Canon shooters, who have been waiting since the introduction of sub-$1000 4K cameras from Panasonic, Sony and Samsung last year for Canon to introduce an affordable 4K video camera. 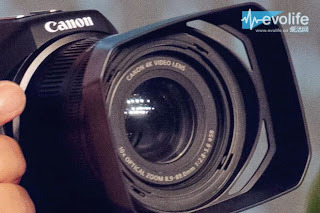 If Canon includes a decent codec, a headphone jack and more than 30 minutes of recording time, the EOS One becomes a very interesting video camera and serious competition for the FZ1000 (depending on price, of course). Hopefully, we'll get more details at NAB - but if this is a sign of things to come from Canon, it could mean a great show for them in Vegas this year. 4K JVC GY-LS300 Super 35 camcorder in stock now!